After more than 20 years working at some of the world’s largest companies, including Frito-Lay, Sears, and AutoZone, Brian Clawson of Zanesville, Ohio is successfully running his own business with TapSnap. Since launching his TapSnap, Clawson has found free time to spend with his family, something corporate America scarcely afforded him. In fact, the transition from the corporate world to business ownership has allowed him the flexibility to participate in a community organization with his wife. Currently, the couple is undertaking the creation of a new charity organization that works with and rehabilitates the homeless and poverty stricken in central Ohio. 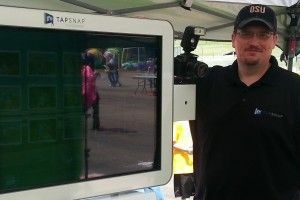 Clawson’s most notable event as a TapSnap franchisee was the Duncan Falls Elementary Spring Carnival, where Clawson was able to give back to the community through fundraising for the Duncan Falls parent-teacher organization. Actively involved in the Zanesville-Muskingum County Chamber of Commerce, Clawson is currently operating in Licking, Guernsey, and Muskingum counties.